Do you remember the days of gym class when two captains would take turns picking the teams. Now, this may be a good memory for some, if you got picked in the early rounds, or it may be a painful memory if you were one of the ones wondering if you were going to be that poor soul who got picked last. Well, I was blessed with just enough athleticism to not have to worry about being the pick nobody wanted. For some of you, the opposite is true. It’s just a part of life to be passed over from time to time. It may be a result of not having enough experience or just not being good enough at a particular thing. But what is not ok is to face rejection because of the color of our skin, political affiliation, economic and social background, etc. James makes it abundantly clear in chapter 2 that we must part from partiality! It does not bring God glory. It does not honor those who were created in His image. And quite frankly, it is sin. For most of us, it may be in subtle ways that we show partiality. Perhaps you stick with certain people at church because they look like you, think like you, and live in the same social class as you. Perhaps you form opinions of certain types of people, whether because of color or social standing, without actually getting to know them. How hard do we try to get to know those that are not like us? To understand them, to better appreciate them, and to better serve them. So how can we part from partiality? Be a part of their lives! Get to know, love and serve those that look, act, and think different than you! Who am I tempted to “look down” on? Why do you think that is? What would it look like to better understand and appreciate them? 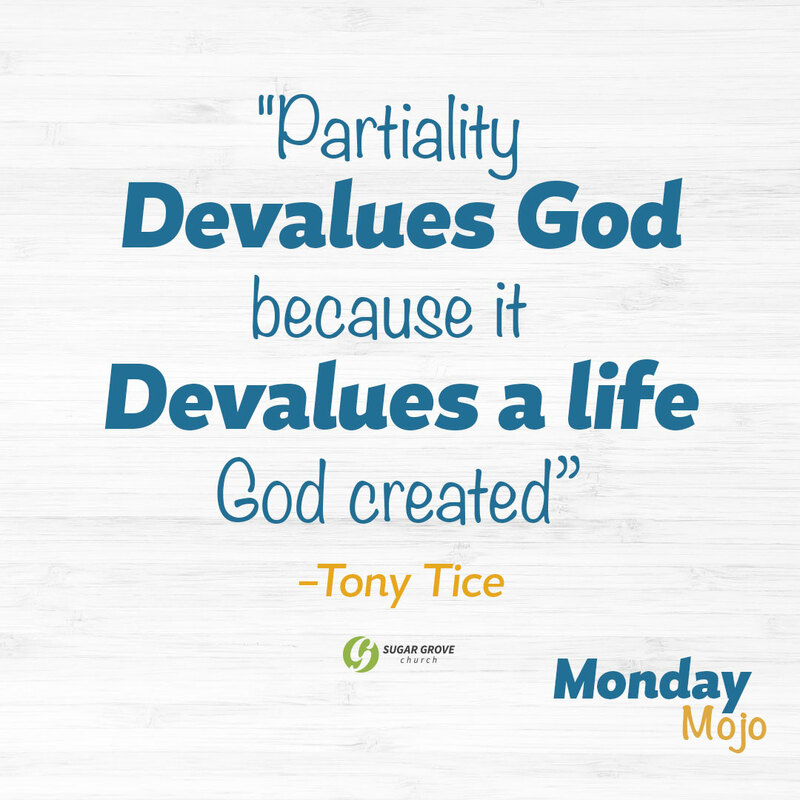 Have you experienced someone showing partiality against you? How so? Have you forgiven them? Commit to spending time over the next couple of weeks with someone that is different than you. If you’ve shown partiality, go to the individual and seek forgiveness. If you’ve been the one offended, go and get things right with them.